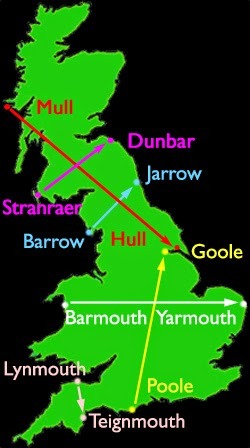 I'm now en route, as we say in English, from Barmouth to (Great) Yarmouth, as the second of my series of coast-to-coast bike tours between rhyming English towns. My train arrived at Barmouth around 4pm, just in time for the torrential rain to start. Barmouth's tourist info was closed for staff training, so I couldn't ask them where to buy the once-famous biscuits. Perhaps they all ended up in my grandma's airing cupboard. The most notable attraction in Barmouth is not the beach, but the Carousal cafe (supposedly a mis-spelling of 'Carousel') whose initial letter dropped off a few years ago. It has become so famous for its truncated new name that they haven't bothered to replace it. 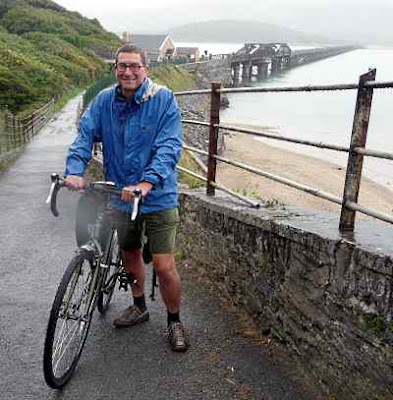 The second most notable attraction in Barmouth is the historic wooden bridge that carries trains, pedestrians and bikes across the Mawddach estuary. The Victorians built it and it survived being eaten by worms in the 20th century. On the other side is a lovely traffic-free rail trail running all alongside the estuary ten miles or so to Dolgellau, where I'm staying, and where it's raining. Hard.